Project Details: This project welcomes both local and international volunteers. 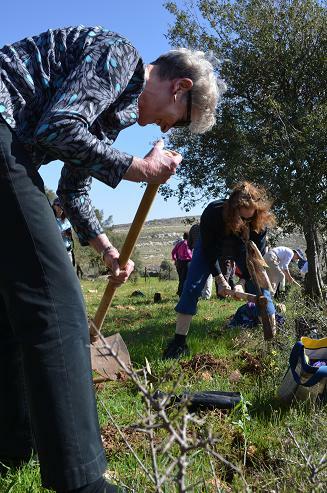 During the camp you will experience planting different types of trees and help us bring new life to the farm. A special program will be prepared for each day, which will include orientation, learning about the land situation, lectures, workshops, documentary movies and field trips to Bethlehem and surroundings.. Weather (March): The weather is usually warm, windy with light rain and temperatures between 18º-24º. On the farm it is usually warm but windy during the day and gets cold in the evenings – around 10º. Please be aware that during this period, the weather is changeable; it can rain at any time but we can also enjoy a lot of sun. In the event of rain, the program will go on; we will switch the days and arrange for tree planting on the drier days. Food: Traditional Palestinian meals will be prepared for volunteers at breakfast, lunch and dinner. Snacks and refreshments will be available for purchase from the snack bar. Please inform us of any dietary requirements.